The IncluSMe project offers modules for higher education (HE), i.e. course units to be used in lectures, seminars or workshops for prospective mathematics and science teachers at universities, i.e. in the initial teacher education (ITE). 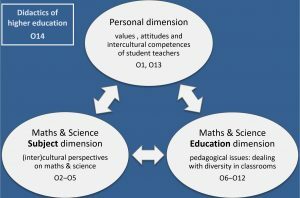 Mathematics and Science education dimension: pedagogical issues, in particular in respect to dealing with diversity in classrooms. Our 14 Modules (so-called outputs (o) for higher education are assigned to these dimensions as the following picture shows. 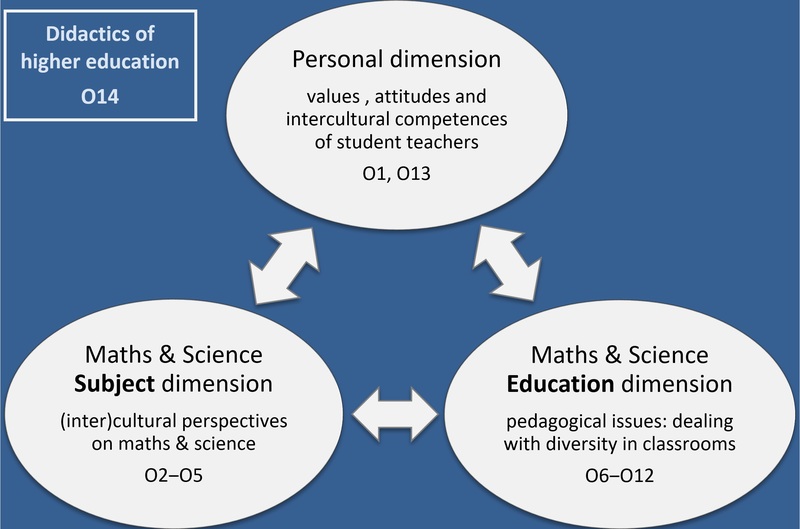 The first module O1 introduces all three dimensions of intercultural learning focussing on what is relevant for mathematics and science prospective teachers. Module O1 as well as module O13 “Accompanying prospective teachers in making intercultural experiences” put a special emphasis on the personal dimension; they motivate students to reflect their own values and attitudes in order to develop intercultural competences. Modules O2 – O5 focus on the Mathematics and Science subject dimension, and modules O6‒O12 focus on the Mathematics and Science education dimension. Methodological and structural basis of all modules is module O14 “Design of learning environments for higher education”. The diagram gives an overview of the proposed modules for higher education.